Playing catch on the field... How cool!? Arguably the best baseball film ever made, Bull Durham follows Crash Davis, a career minor leaguer, as he struggles through one more year in the Carolina league with the Durham Bulls. Filmed in only 8 weeks and for only $9 million, the movie was a box office hit and made one of the oldest franchise in professional baseball, The Bulls, an international phenomenon. 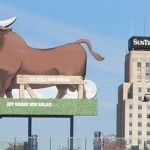 The original stadium is long gone but the Bulls still wear the same uniforms and a replica “Win a Steak Bull” is still perched on an outfield wall. 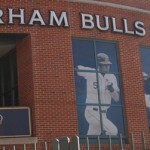 Ever since I saw the movie, I’ve wanted to see the team play but as we are passing through Durham in late fall that wasn’t possible. However, we were lucky enough to be in town for their Fall Fan Fest. Not only is the event free but the first 100 fans recieved a Wool E. Bull Christmas ornament (pictured at right) and a free lunch. But that’s not all. For a donation of three cans of food (though every visitor got in) you were allowed to walk to the clubhouse, see the players actual lockers, and spemd time in the dugout. You also got to play catch on the outfield grass. Below are some pictures and a few of our favorite clips of the movie.